So this is going to be the first Christmas/Festive post of many to come, are you excited?! I'm excited! 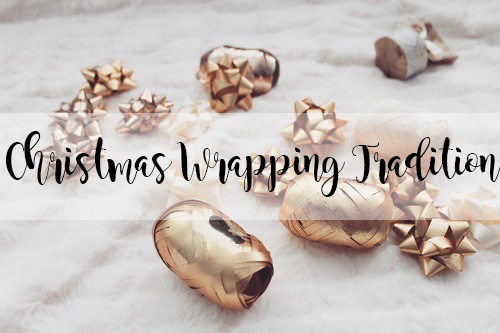 I wanted to start off the festive fun by sharing my Christmas wrapping tradition with you! I absolutely love wrapping presents and it's my favourite thing to do on the run up to Christmas. Apart from baking lots of cakes and cookies of course. But for the fun stuff which doesn't make me fat, wrapping comes next in line! Since being with my boyfriend, I'm able to share my love for wrapping presents with him while he sits there and holds pieces of paper and the cello-tape for me while I do the rest! I'm sure he enjoys it as much as I do. Now it has become a tradition to wrap all of his presents at home with my mum (so she can be my helping hand) and then I take all of my families and friends presents to his house so he can be my helping hand. In return I have to also wrap all of his families presents for him as he isn't the best person when it comes to wrapping! (He just doesn't know where to start). But he is improving! I definitely went over board with wrapping paper this year, with around four different designs and I think 7 rolls of paper in total! I couldn't help myself and I still wanted to buy more! The best part of wrapping for me is creating the ribbon and bow around the present, I find it very therapeutic and I'd happily have a job as an elf around this time of year just so I can wrap everyone's presents for a good few months! Wrapping presents makes my Christmas build up so special because it's a way of bringing everyone together before Christmas. Deciding what they want for Christmas, finding little bits and pieces for surprises and then taking the time to wrap them up in the most beautiful way possible! I like to take time and consideration into my wrapping and this is something I have done since I was very little while helping my mum wrap everyone's presents. It's difficult to explain why I love it so much, but I'm sure if you're reading this, you probably understand the joy from it too! This post was in collaboraton with Satsuma Loans as part of their Satsuma Thrifty Christmas Campaign however all opinions are my own. Make sure to check their campaign out! Ah I love wrapping, got to be one of my favourite things on the run up to Christmas!